After you construct and test your Apache Beam pipeline, you can use the Cloud Dataflow managed service to deploy and execute it. Once on the Cloud Dataflow service, your pipeline code becomes a Cloud Dataflow job. The Cloud Dataflow service fully manages Google Cloud Platform (GCP) services such as Compute Engine and Cloud Storage to run your Cloud Dataflow job, automatically spinning up and tearing down the necessary resources. The Cloud Dataflow service provides visibility into your job through tools like the Cloud Dataflow Monitoring Interface and the Cloud Dataflow Command-line Interface. You can control some aspects of how the Cloud Dataflow service runs your job by setting execution parameters in your pipeline code. For example, the execution parameters specify whether the steps of your pipeline run on worker virtual machines, on the Cloud Dataflow service backend, or locally. Parallelization and Distribution. Cloud Dataflow automatically partitions your data and distributes your worker code to Compute Engine instances for parallel processing. Optimization. Cloud Dataflow uses your pipeline code to create an execution graph that represents your pipeline's PCollections and transforms, and optimizes the graph for the most efficient performance and resource usage. Cloud Dataflow also automatically optimizes potentially costly operations, such as data aggregations. Automatic Tuning features. The Cloud Dataflow service includes several features that provide on-the-fly adjustment of resource allocation and data partitioning, such as Autoscaling and Dynamic Work Rebalancing. These features help the Cloud Dataflow service execute your job as quickly and efficiently as possible. When you run your Cloud Dataflow program, Cloud Dataflow creates an execution graph from the code that constructs your Pipeline object, including all of the transforms and their associated processing functions (such as DoFns). This phase is called Graph Construction Time. During graph construction, Cloud Dataflow checks for various errors and ensures that the your pipeline graph doesn't contain any illegal operations. The execution graph is translated into JSON format, and the JSON execution graph is transmitted to the Cloud Dataflow service endpoint. Note: Graph construction also happens when you execute your pipeline locally, but the graph is not translated to JSON or transmitted to the service. Instead, the graph is run locally on the same machine where you launched your Cloud Dataflow program. See the documentation on configuring for local execution for more details. The Cloud Dataflow service then validates the JSON execution graph. When the graph is validated, it becomes a job on the Cloud Dataflow service. You'll be able to see your job, its execution graph, status, and log information by using the Cloud Dataflow Monitoring Interface. The Cloud Dataflow service sends a response to the machine where you ran your Cloud Dataflow program. This response is encapsulated in the object DataflowPipelineJob, which contains your Cloud Dataflow job's jobId. You can use the jobId to monitor, track, and troubleshoot your job using the Cloud Dataflow Monitoring Interface and the Cloud Dataflow Command-line Interface. See the API reference for DataflowPipelineJob for more information. The Cloud Dataflow service sends a response to the machine where you ran your Cloud Dataflow program. This response is encapsulated in the object DataflowPipelineResult, which contains your Cloud Dataflow job's job_id. You can use the job_id to monitor, track, and troubleshoot your job using the Cloud Dataflow Monitoring Interface and the Cloud Dataflow Command-line Interface. Cloud Dataflow builds a graph of steps that represents your pipeline, based on the transforms and data you used when you constructed your Pipeline object. This is the pipeline execution graph. The execution graph often differs from the order in which you specified your transforms when you constructed the pipeline. This is because the Cloud Dataflow service performs various optimizations and fusions on the execution graph before it runs on managed cloud resources. The Cloud Dataflow service respects data dependencies when executing your pipeline; however, steps without data dependencies between them may be executed in any order. You can see the unoptimized execution graph that Cloud Dataflow has generated for your pipeline when you select your job in the Cloud Dataflow Monitoring Interface. The Cloud Dataflow service automatically parallelizes and distributes the processing logic in your pipeline to the workers you've allotted to perform your job. Cloud Dataflow uses the abstractions in the programming model to represent parallel processing functions; for example, your ParDo transforms cause Cloud Dataflow to automatically distribute your processing code (represented by DoFns) to multiple workers to be run in parallel. You can think of your DoFn code as small, independent entities: there can potentially be many instances running on different machines, each with no knowledge of the others. As such, pure functions (functions that do not depend on hidden or external state, that have no observable side effects, and are deterministic) are ideal code for the parallel and distributed nature of DoFns. The Cloud Dataflow service guarantees that every element in your input PCollection is processed by a DoFn instance exactly once. The Cloud Dataflow service does not guarantee how many times a DoFn will be invoked. The Cloud Dataflow service does not guarantee exactly how the distributed elements are grouped—that is, it does not guarantee which (if any) elements are processed together. The Cloud Dataflow service does not guarantee the exact number of DoFn instances that will be created over the course of a pipeline. The Cloud Dataflow service is fault-tolerant, and may retry your code multiple times in the case of worker issues. The Cloud Dataflow service may create backup copies of your code, and can have issues with manual side effects (such as if your code relies upon or creates temporary files with non-unique names). The Cloud Dataflow service serializes element processing per DoFn instance. Your code does not need to be strictly thread-safe; however, any state shared between multiple DoFn instances must be thread-safe. See Requirements for User-Provided Functions in the programming model documentation for more information about building your user code. Your pipeline may throw exceptions while processing data. Some of these errors are transient (e.g., temporary difficulty accessing an external service), but some are permanent, such as errors caused by corrupt or unparseable input data, or null pointers during computation. Cloud Dataflow processes elements in arbitrary bundles, and retries the complete bundle when an error is thrown for any element in that bundle. When running in batch mode, bundles including a failing item are retried 4 times. The pipeline will fail completely when a single bundle has failed 4 times. When running in streaming mode, a bundle including a failing item will be retried indefinitely, which may cause your pipeline to permanently stall. Note: When processing in batch mode, you might see a large number of individual failures before a pipeline job fails completely (which happens when any given bundle fails after four retry attempts). For example, if your pipeline attempts to process 100 bundles, Cloud Dataflow could theoretically generate several hundred individual failures until a single bundle reaches the 4-failure condition for exit. Once the JSON form of your pipeline's execution graph has been validated, the Cloud Dataflow service may modify the graph to perform optimizations. Such optimizations can include fusing multiple steps or transforms in your pipeline's execution graph into single steps. Fusing steps prevents the Cloud Dataflow service from needing to materialize every intermediate PCollection in your pipeline, which can be costly in terms of memory and processing overhead. While all the transforms you've specified in your pipeline construction are executed on the service, they may be executed in a different order, or as part of a larger fused transform to ensure the most efficient execution of your pipeline. The Cloud Dataflow service respects data dependencies between the steps in the execution graph, but otherwise steps may be executed in any order. There are a few cases in your pipeline where you may want to prevent the Cloud Dataflow service from performing fusion optimizations. These are cases in which the Cloud Dataflow service might incorrectly guess the optimal way to fuse operations in the pipeline, which could limit the Cloud Dataflow service's ability to make use of all available workers. For example, one case in which fusion can limit Cloud Dataflow's ability to optimize worker usage is a "high fan-out" ParDo. In such an operation, you might have an input collection with relatively few elements, but the ParDo produces an output with hundreds or thousands of times as many elements, followed by another ParDo. If the Cloud Dataflow service fuses these ParDo operations together, parallelism in this step is limited to at most the number of items in the input collection, even though the intermediate PCollection contains many more elements. You can insert a GroupByKey and ungroup after your first ParDo. The Cloud Dataflow service never fuses ParDo operations across an aggregation. You can pass your intermediate PCollection as a side input to another ParDo. The Cloud Dataflow service always materializes side inputs. Aggregation operations are an important concept in large-scale data processing. Aggregation brings together data that's conceptually far apart, making it extremely useful for correlating. The Cloud Dataflow programming model represents aggregation operations as the GroupByKey, CoGroupByKey, and Combine transforms. Cloud Dataflow's aggregation operations combine data across the entire data set, including data that may be spread across multiple workers. During such aggregation operations, it's often most efficient to combine as much data locally as possible before combining data across instances. When you apply a GroupByKey or other aggregating transform, the Cloud Dataflow service automatically performs partial combining locally before the main grouping operation. Note: Because the Cloud Dataflow service automatically performs partial local combining, it is strongly recommended that you do not attempt to make this optimization by hand in your pipeline code. When performing partial or multi-level combining, the Cloud Dataflow service makes different decisions based on whether your pipeline is working with batch or streaming data. For bounded data, the service favors efficiency and will perform as much local combining as possible. For unbounded data, the service favors lower latency, and may not perform partial combining (as it may increase latency). The Cloud Dataflow service contains several autotuning features that can further dynamically optimize your Cloud Dataflow job while it is running. These features include Autoscaling and Dynamic Work Rebalancing. With autoscaling enabled, the Cloud Dataflow service automatically chooses the appropriate number of worker instances required to run your job. The Cloud Dataflow service may also dynamically re-allocate more workers or fewer workers during runtime to account for the characteristics of your job. Certain parts of your pipeline may be computationally heavier than others, and the Cloud Dataflow service may automatically spin up additional workers during these phases of your job (and shut them down when they're no longer needed). Autoscaling is enabled by default on all batch Cloud Dataflow jobs. You can disable autoscaling by explicitly specifying the option --autoscalingAlgorithm=NONE when you run your pipeline; if so, note that the Cloud Dataflow service sets the number of workers based on the --numWorkers option, which defaults to 3. If your Cloud Dataflow job uses an earlier version of the SDK, you can enable autoscaling by specifying the option --autoscalingAlgorithm=THROUGHPUT_BASED when you run your pipeline. Note: With autoscaling enabled, the Cloud Dataflow service does not allow user control of the exact number of worker instances allocated to your job. You may still cap the number of workers by specifying the --maxNumWorkers option when you run your pipeline. Autoscaling is enabled by default on all batch Cloud Dataflow jobs created using the Apache Beam SDK for Python version 0.5.1 or higher. You can disable autoscaling by explicitly specifying the option --autoscaling_algorithm=NONE when you run your pipeline; if so, note that the Cloud Dataflow service sets the number of workers based on the --num_workers option, which defaults to 3. If your Cloud Dataflow job uses an earlier version of the SDK, you can enable autoscaling by specifying the option --autoscaling_algorithm=THROUGHPUT_BASED when you run your pipeline. Note: With autoscaling enabled, the Cloud Dataflow service does not allow user control of the exact number of worker instances allocated to your job. You may still cap the number of workers by specifying the --max_num_workers option when you run your pipeline. Autoscaling is enabled by default on all batch Cloud Dataflow jobs created using the Cloud Dataflow SDK for Java version 1.6.0 or higher. You can disable autoscaling by explicitly specifying the option --autoscalingAlgorithm=NONE when you run your pipeline; if so, note that the Cloud Dataflow service sets the number of workers based on the --numWorkers option, which defaults to 3. For bounded data in batch mode, Cloud Dataflow automatically chooses the number of workers based on both the amount of work in each stage of your pipeline and the current throughput at that stage. In your BoundedSource subclass, implement the method getEstimatedSizeBytes. The Cloud Dataflow service uses getEstimatedSizeBytes when calculating the initial number of workers to use for your pipeline. In your BoundedReader subclass, implement the method getFractionConsumed. 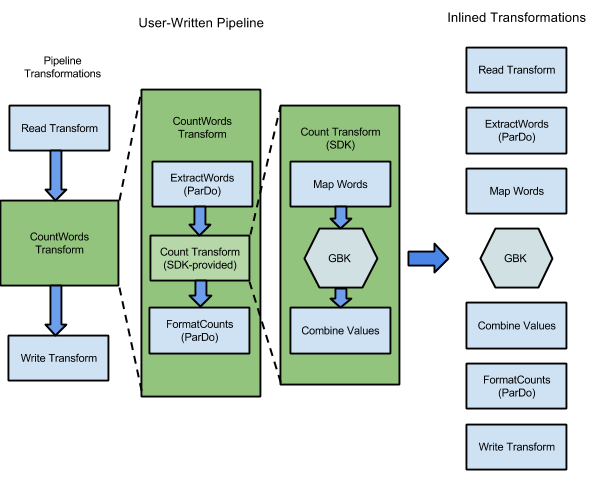 The Cloud Dataflow service uses getFractionConsumed to track read progress and converge on the correct number of workers to use during a read. In your BoundedSource subclass, implement the method estimate_size. The Cloud Dataflow service uses estimate_size when calculating the initial number of workers to use for your pipeline. In your RangeTracker subclass, implement the method fraction_consumed. 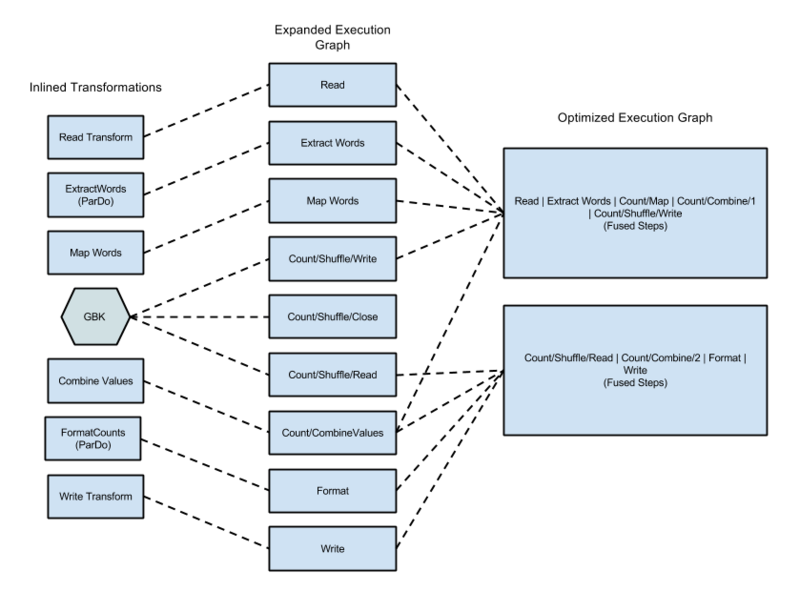 The Cloud Dataflow service uses fraction_consumed to track read progress and converge on the correct number of workers to use during a read. This is a beta release of Streaming Autoscaling. This feature might be changed in backward-incompatible ways and is not subject to any SLA or deprecation policy. Streaming autoscaling allows the Cloud Dataflow service to adaptively change the number of workers used to execute your streaming pipeline in response to changes in load and resource utilization. Streaming autoscaling is a free feature and is designed to reduce the costs of the resources used when executing streaming pipelines. Without autoscaling, you would choose a fixed number of workers (by specifying --numWorkers) to execute your pipeline. As the input workload varies over time, this number can become either too high or too low. Provisioning too many workers results in unnecessary extra cost, and provisioning too few workers results in higher latency for processed data. By enabling autoscaling, resources are used only as they are needed. To make scaling decisions, autoscaling relies on several signals that assess how busy workers are and whether they can keep up with the input stream. Key signals include CPU utilization, throughput, and backlog. The objective is to minimize backlog while maximizing worker utilization and throughput, and quickly react to spikes in load. By enabling autoscaling, you don't have to choose between provisioning for peak load and fresh results. Workers are added as CPU utilization and backlog increase and are removed as these metrics come down. This way, you’re paying only for what you need, and the job is processed as efficiently as possible. If your pipeline uses a custom unbounded source, it is essential that the source informs the Cloud Dataflow service about backlog. Backlog is an estimate of the input in bytes that has not yet been processed by the source. To inform the service about backlog, implement either one of the following methods in your UnboundedReader class. getSplitBacklogBytes() - Backlog for the current split of the source. The service aggregates backlog across all the splits. getTotalBacklogBytes() - The global backlog across all the splits. In some cases the backlog is not available for each split and can only be calculated across all the splits. Only the first split (split id ‘0’) needs to provide total backlog. The Apache Beam repository contains several examples of custom sources that implement the UnboundedReader class. Autoscaling may oscillate between N/15 and N workers during the execution of a pipeline, where N is the value of --maxNumWorkers. For example, if your pipeline needs 3 or 4 workers in steady state, you could set --maxNumWorkers=15 and the pipeline will automatically scale between 1 and 15 workers. Streaming pipelines are deployed with a fixed pool of persistent disks, equal in number to --maxNumWorkers. Take this into account when you specify --maxNumWorkers, and ensure this value is a sufficient number of disk(s) for your pipeline. NOTE: If you've reached a scaling limit and want to raise the --maxNumWorkers, you'll need to submit a new job with a higher --maxNumWorkers. If you want to update a streaming autoscaling job, make sure --maxNumWorkers remains the same (see the section on manually scaling streaming pipelines). Note that not specifying the --autoscalingAlgorithm pipeline option in the Update command disables autoscaling for the updated job. Compute Engine usage is based on the average number of workers, while persistent disk usage is based on the exact number of --maxNumWorkers. Persistent disks are redistributed such that each worker gets an equal number of attached disks. In the example above, where --maxNumWorkers=15, you will pay for between 1 and 15 Compute Engine instances and exactly 15 persistent disks. This feature is not yet supported in the Apache Beam SDK for Python. Currently, PubsubIO is the only source that supports autoscaling on streaming pipelines. All SDK-provided sinks are supported. In this Beta release, Autoscaling works smoothest when reading from Cloud Pub/Sub subscriptions tied to topics published with small batches and when writing to sinks with low latency. In extreme cases (i.e. Cloud Pub/Sub subscriptions with large publishing batches or sinks with very high latency), autoscaling is known to become coarse-grained. This will be improved in future releases. Until autoscaling is generally available in streaming mode, there is a workaround you can use to manually scale the number of workers running your streaming pipeline by using Cloud Dataflow's Update feature. Set --maxNumWorkers equal to the maximum number of workers you want available to your pipeline. Set --numWorkers equal to the initial number of workers you want your pipeline to use when it starts running. Once your pipeline is running, you can Update your pipeline and specify a new number of workers using the --numWorkers parameter. The value you set for the new --numWorkers must be between N and --maxNumWorkers, where N is equal to --maxNumWorkers / 15. Update replaces your running job with a new job, using the new number of workers, while preserving all state information associated with the previous job. Note: Your pipeline's maximum scaling range is dependent upon the number of persistent disks deployed when the pipeline starts. The Cloud Dataflow service deploys one persistent disk per worker at the maximum number of workers. Deploying extra persistent disks by setting --maxNumWorkers to a higher value than --numWorkers provides some benefits to your pipeline—specifically, it allows you the flexibility to scale your pipeline to a larger number of workers after startup, and may provide improved performance. However, your pipeline might also incur additional cost for the extra persistent disks. Take note of the cost and quota implications of the additional persistent disk resources when planning your streaming pipeline and setting the scaling range. Note: It is not possible to change the scaling range of a pipeline by using the Update feature. If you need to scale further, you'll need to start a new pipeline and specify a higher value for --maxNumWorkers as the ceiling of your desired scaling range. The Cloud Dataflow service automatically detects these conditions and can dynamically reassign work to unused or underused workers to decrease your job's overall processing time. Dynamic Work Rebalancing only happens when the Cloud Dataflow service is processing some input data in parallel: when reading data from an external input source, when working with a materialized intermediate PCollection, or when working with the result of an aggregation like GroupByKey. If a large number of steps in your job are fused, there are fewer intermediate PCollections in your job and Dynamic Work Rebalancing will be limited to the number of elements in the source materialized PCollection. If you want to ensure that Dynamic Work Rebalancing can be applied to a particular PCollection in your pipeline, you can prevent fusion in a few different ways to ensure dynamic parallelism. Dynamic Work Rebalancing cannot re-parallelize data finer than a single record. If your data contains individual records that cause large delays in processing time, they may still delay your job, since Cloud Dataflow cannot subdivide and redistribute an individual "hot" record to multiple workers. If you've set a fixed number of shards for your pipeline's final output (for example, by writing data using TextIO.Write.withNumShards), parallelization will be limited based on the number of shards that you've chosen. If you've set a fixed number of shards for your pipeline's final output (for example, by writing data using beam.io.WriteToText(..., num_shards=...)), Cloud Dataflow will limit parallelization based on the number of shards that you've chosen. The fixed-shards limitation can be considered temporary, and may be subject to change in future releases of the Cloud Dataflow service. If your pipeline uses a custom data source that you provide, you must implement the method splitAtFraction to allow your source to work with the Dynamic Work Rebalancing feature. Caution: Using Dynamic Work Rebalancing with custom data sources is an extremely advanced use case. If you choose to implement splitAtFraction, it is critical that you test your code extensively and with maximum code coverage. If you implement splitAtFraction incorrectly, records from your source may appear to get duplicated or dropped. See the API reference information on RangeTracker for help and tips on implementing splitAtFraction. If your pipeline uses a custom data source that you provide, your RangeTracker must implement try_claim, try_split, position_at_fraction, and fraction_consumed to allow your source to work with the Dynamic Work Rebalancing feature. See the API reference information on RangeTracker for more information. The Cloud Dataflow service fully manages resources in GCP on a per-job basis. This includes spinning up and shutting down Compute Engine instances (occasionally referred to as workers or VMs) and accessing your project's Cloud Storage buckets for both I/O and temporary file staging. However, if your pipeline interacts with GCP data storage technologies like BigQuery and Cloud Pub/Sub, you must manage the resources and quota for those services. Cloud Dataflow uses a user provided location in Cloud Storage specifically for staging files. This location is under your control, and you should ensure that the location's lifetime is maintained as long as any job is reading from it. You can re-use the same staging location for multiple job runs, as the SDK's built-in caching can speed up the start time for your jobs. Caution: Manually altering Cloud Dataflow-managed Compute Engine resources associated with a Cloud Dataflow job is an unsupported operation. You should not attempt to manually stop, delete, or otherwise control the Compute Engine instances that Cloud Dataflow has created to run your job. In addition, you should not alter any persistent disk resources associated with your Cloud Dataflow job. You may run up to 25 concurrent Cloud Dataflow jobs per GCP project. The Cloud Dataflow service is currently limited to processing JSON job requests that are 20 MB in size or smaller. The size of the job request is specifically tied to the JSON representation of your pipeline; a larger pipeline means a larger request. This command writes a JSON representation of your job to a file. The size of the serialized file is a good estimate of the size of the request; the actual size will be slightly larger due to some additional information included in the request. For more information, see the troubleshooting page for 413 Request Entity Too Large / "The size of serialized JSON representation of the pipeline exceeds the allowable limit". In addition, your job's graph size must not exceed 10 MB. For more information, see the troubleshooting page for "The job graph is too large. Please try again with a smaller job graph, or split your job into two or more smaller jobs.". The Cloud Dataflow service currently allows a maximum of 1000 Compute Engine instances per job. The default machine type is n1-standard-1 for a batch job, and n1-standard-4 for streaming; when using the default machine types, the Cloud Dataflow service can therefore allocate up to 4000 cores per job. Note: The Cloud Dataflow managed service now deploys Compute Engine virtual machines associated with Cloud Dataflow jobs using Managed Instance Groups. A Managed Instance Group creates multiple Compute Engine instances from a common template and allows you to control and manage them as a group. That way, you don't have to individually control each instance associated with your pipeline. You should not attempt to manage or otherwise interact directly with your Compute Engine Managed Instance Group; the Cloud Dataflow service will take care of that for you. Manually altering any Compute Engine resources associated with your Cloud Dataflow job is an unsupported operation. Cloud Dataflow supports n1series workers as well as custom machine types. You can specify a machine type for your pipeline by setting the appropriate execution parameter at pipeline creation time. Caution: Shared core machine types such as f1 and g1 series workers are not supported under Cloud Dataflow's Service Level Agreement. To change the machine type, set the --workerMachineType option. To change the machine type, set the --worker_machine_type option. Note: The Cloud Dataflow service currently does not support the use of preemptible virtual machines. The Cloud Dataflow service checks to ensure that your GCP project has the Compute Engine resource quota required to run your job, both to start the job and scale to the maximum number of worker instances. Your job will fail to start if there is not enough resource quota available. Caution: Manually changing your Cloud Dataflow job's Instance Template or Managed Instance Group is not recommended or supported. Use Cloud Dataflow's pipeline configuration options instead. Cloud Dataflow's Autoscaling feature is limited by your project's available Compute Engine quota. If your job has sufficient quota when it starts, but another job uses the remainder of your project's available quota, the first job will run but not be able to fully scale. However, the Cloud Dataflow service does not manage quota increases for jobs that exceed the resource quotas in your project. You are responsible for making any necessary requests for additional resource quota, for which you can use the Google Cloud Platform Console. The Cloud Dataflow service is currently limited to 15 persistent disks per worker instance when running a streaming job. Each persistent disk is local to an individual Compute Engine virtual machine. Your job may not have more workers than persistent disks; a 1:1 ratio between workers and disks is the minimum resource allotment. The default size of each persistent disk is 250 GB in batch mode and 400 GB in streaming mode. By default, the Cloud Dataflow service deploys Compute Engine resources in the us-central1-f zone of the us-central1 region. You can override this setting by specifying the --region parameter. If you need to use a specific zone for your resources, use the --zone parameter when you create your pipeline. However, we recommend that you only specify the region, and leave the zone unspecified. This allows the Cloud Dataflow service to automatically select the best zone within the region based on the available zone capacity at the time of the job creation request. For more information, see the regional endpoints documentation. Currently, the Cloud Dataflow pipeline runner executes the steps of your streaming pipeline entirely on worker virtual machines, consuming worker CPU, memory, and Persistent Disk storage. Cloud Dataflow's Streaming Engine moves pipeline execution out of the worker VMs and into the Cloud Dataflow service backend. A reduction in consumed CPU, memory, and Persistent Disk storage resources on the worker VMs. Streaming Engine works best with smaller worker machine types (n1-standard-2 instead of n1-standard-4) and does not require Persistent Disk beyond a small worker boot disk, leading to less resource and quota consumption. More responsive autoscaling in response to variations in incoming data volume. Streaming Engine offers smoother, more granular scaling of workers. Improved supportability, since you don’t need to redeploy your pipelines to apply service updates. Most of the reduction in worker resources comes from offloading the work to the Cloud Dataflow service. For that reason, there is a charge associated with the use of Streaming Engine. However, the total bill for Cloud Dataflow pipelines using Streaming Engine is expected to be approximately the same compared to the total cost of Cloud Dataflow pipelines that do not use this option. Streaming Engine is currently available for streaming pipelines in the following regions. It will become available in additional regions in the future. Note: Updating an already-running pipeline to use Streaming Engine is not currently supported. If your pipeline is already running in production and you would like to use Streaming Engine, you need to stop your pipeline using the Cloud Dataflow Drain option. Then, specify the Streaming Engine parameter and rerun your pipeline. Note: Streaming Engine requires the Apache Beam SDK for Java, versions 2.10.0 or higher. --enableStreamingEngine if you're using Apache Beam SDK for Java versions 2.11.x or higher. --experiments=enable_streaming_engine if you're using Apache Beam SDK for Java versions 2.10.x or lower. If you use Cloud Dataflow Streaming Engine for your pipeline, do not specify the --zone parameter. Instead, specify the --region parameter and set the value to one of the regions where Streaming Engine is currently available. Cloud Dataflow auto-selects the zone in the region you specified. If you do specify the --zone parameter and set it to a zone outside of the available regions, Cloud Dataflow reports an error. Streaming Engine works best with smaller worker machine types, so we recommend that you set --workerMachineType=n1-standard-2. You can also set --diskSizeGb=30 because Streaming Engine only needs space for the worker boot image and local logs. These values are the default values in case you don't set them explicitly. Streaming Engine is not supported in the Cloud Dataflow SDK for Java version 1.x. To use this feature, you must use Apache Beam SDK for Java 2.8.0 or greater. Cloud Dataflow Shuffle is the base operation behind Cloud Dataflow transforms such as GroupByKey, CoGroupByKey, and Combine. The Cloud Dataflow Shuffle operation partitions and groups data by key in a scalable, efficient, fault-tolerant manner. Currently, Cloud Dataflow uses a shuffle implementation that runs entirely on worker virtual machines and consumes worker CPU, memory, and Persistent Disk storage. The service-based Cloud Dataflow Shuffle feature, available for batch pipelines only, moves the shuffle operation out of the worker VMs and into the Cloud Dataflow service backend. Faster execution time of batch pipelines for the majority of pipeline job types. A reduction in consumed CPU, memory, and Persistent Disk storage resources on the worker VMs. Better autoscaling since VMs no longer hold any shuffle data and can therefore be scaled down earlier. Better fault tolerance; an unhealthy VM holding Cloud Dataflow Shuffle data will not cause the entire job to fail, as would happen if not using the feature. Most of the reduction in worker resources comes from offloading the shuffle work to the Cloud Dataflow service. For that reason, there is a charge associated with the use of Cloud Dataflow Shuffle. However, the total bill for Cloud Dataflow pipelines using the service-based Cloud Dataflow implementation is expected to be less than or equal to the cost of Cloud Dataflow pipelines that do not use this option. For the majority of pipeline job types, Cloud Dataflow Shuffle is expected to execute faster than the shuffle implementation running on worker VMs. However, the execution times might vary from run to run. If you are running a pipeline that has important deadlines, we recommend allocating sufficient buffer time before the deadline. In addition, consider requesting a bigger quota for Shuffle. A worker VM uses part of the 25 GB of disk space for the operating system, binaries, logs, and containers. Jobs that use a significant amount of disk and exceed the remaining disk capacity may fail when you use Cloud Dataflow Shuffle. Jobs that use a lot of disk I/O may be slow due to the performance of the small disk. For more information about performance differences between disk sizes, see the Compute Engine Persistent Disk Performance page. If any of these considerations apply to your job, you can use pipeline options to specify a larger disk size. Cloud Dataflow Shuffle will become available in additional regions in the future. Note: Performance differences in the asia-northeast1 (Tokyo) region: We recommend using Cloud Dataflow Shuffle with large datasets (greater than 1 TB) when you run pipelines in the asia-northeast1 (Tokyo) region. Using Shuffle with smaller datasets in the asia-northeast1 (Tokyo) region does not give you the same performance advantages as Shuffle in other regions. If you use Cloud Dataflow Shuffle for your pipeline, do not specify the --zone parameter. Instead, specify the --region parameter and set the value to one of the regions where Shuffle is currently available. Cloud Dataflow autoselects the zone in the region you specified. If you do specify the --zone parameter and set it to a zone outside of the available regions, Cloud Dataflow reports an error. Note: To use Cloud Dataflow Shuffle, you must have Apache Beam SDK for Python version 2.1.0 or higher. This is a beta release of FlexRS functionality. This feature might be changed in backward-incompatible ways and is not subject to any SLA or deprecation policy. Cloud Dataflow Flexible Resource Scheduling (FlexRS) minimizes batch processing costs by using a combination of preemptible virtual machine (VM) instances and regular VMs. By running preemptible VMs and regular VMs in parallel, Cloud Dataflow improves the user experience if Compute Engine stops preemptible VM instances during a system event. FlexRS helps to ensure that the pipeline continues to make progress and that you do not lose previous work when Compute Engine preempts your preemptible VMs. For more information about FlexRS, see Using Flexible Resource Scheduling in Cloud Dataflow.